As the US military proudly tests its atomic bombs within sight of the Vegas strip, tourists are flocking into town to see who will be crowned the Miss Atomic Bomb beauty queen. But in the midst of this euphoria, farm girl Candy’s sheep have mysteriously died, her fashionista friend Myrna is designing clothes for pigs, young soldier Joey has deserted the army, and his hapless hotel manager brother Lou desperately needs an atomic gimmick. In a city controlled by the military and the mob, time is running out for our four friends. They are joined by Dean John-Wilson who will take the lead role in Disney’s Aladdin this Summer, Daniel Boys – a finalist in BBC 1’s Any Dream Will Do and rising musical theatre star Florence Andrews. 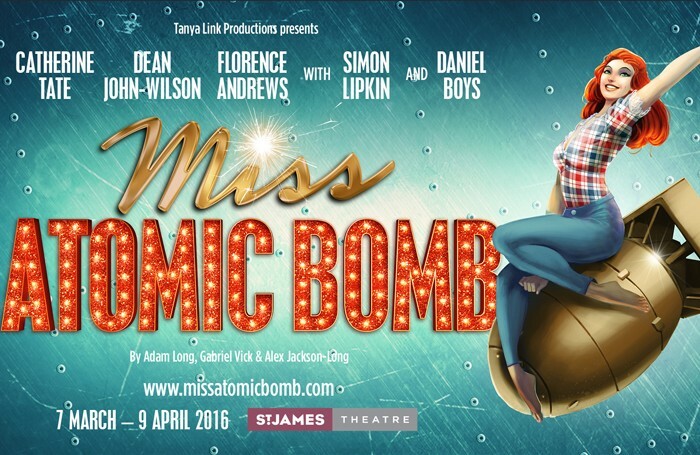 To win a pair of tickets to Miss Atomic Bomb, go to www.thestage.co.uk/competitions and enter your details and ATOMIC in the code box. Entries close at midnight February 28. Terms and conditions: Subject to availability. Non-transferrable.